Please note, this course does not include the exam in the cost. To book the exam and take it at the end of your course please book on code FPMEX-3 with one of our team. What is the APM Project Fundamentals Qualification? The Project Fundamentals Qualification (PFQ) - (SCQF Level 6), developed by APM, the chartered body for the project profession, offers a fundamental awareness of project management terminology. The APM PFQ syllabus assesses the key elements of the project management life cycle and covers knowledge areas from the APM Body of Knowledge, including planning and scheduling, communication, teamwork, resource management, project risk management and project reviews. Delivered by fully accredited trainers and industry leading experts with extensive experience of applying the APM approach, the course ensures that delegates gain sufficient understanding to be confident in the practical application of project management as an informed team member. The Introductory Certificate: The APM Project Fundamentals Qualification course follows the syllabus provided by APM, which is built around the APM Body of Knowledge 6th edition. The course provides delegates with a broad understanding of the underpinning tools, techniques and principles that are fundamental to successful project delivery. The course is intensive and therefore delegates are also advised to undertake some revision work in the evening to prepare for the Introductory Certificate examination that will be taken at the end of the course. It may be beneficial if you bring along your own device for this additional work, which will be required during evenings will comprise consolidation reading and mock examination questions. 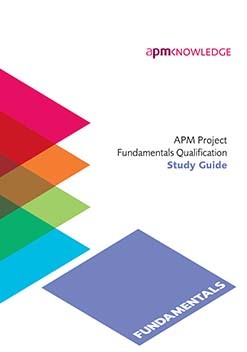 The APM Project Fundamentals Qualification Study Guide is designed to support candidates taking the APM Project Fundamentals Qualification (PFQ), formerly known as Introductory Certificate (IC). The study guide references the syllabus, learning outcomes and assessment criteria aligned to the APM Body of Knowledge 6th edition. Join the APM today to publicly demonstrate your commitment to professionalism and your own continued professional development. Whether you have an interest in improving your project management skills, are starting out in the profession or are already an experienced professional, there’s an APM membership grade designed for you. Visit apm.org.uk/join and start your journey with APM. APM membership - supporting, connecting and developing more than 23,000 project professionals across UK and internationally. It is for those wishing to gain a broad understanding of the principles of the profession. No prior knowledge or experience is required for this qualification, which will offer the individual the knowledge to make a positive contribution to any project. Throughout the Introductory Certificate: The APM Project Fundamentals Qualification course, delegates will be provided with lots of examples of examination questions. There will be a number of exercises and 'question-and-answer' sessions that will help to consolidate the learning, thereby ensuring that delegates are more than adequately prepared for the final examination. Please note: delegates must bring photographic identification with them on the exam day (e.g. passport, driving license, company secure access card, student card) as it is an examination requirement to present it to the invigilator prior to the exam. Failure to produce a valid form of photographic identification may result in a candidate not being able to sit the exams. For any questions about what form of identification is acceptable, please contact your Account Manager or the QA Examination.